Elisabeth Reed holds an award from the Association for the Advancement of Sustainability in Higher Education. Illinois State University has received the 2017 Association for the Advancement of Sustainability in Higher Education (AASHE) Campus Sustainability Achievement Award for its Fix It Friday Program. The award was presented on Sunday, October 15, during the AASHE Conference and Expo held in San Antonio, Texas. Talented Fix It Friday volunteers providing free mending services to the campus and community. Fix It Friday is a collaboration between the Fashion Design and Merchandising Association (FDMA) and the Office of Sustainability. 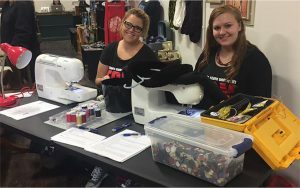 The fashion students set up sewing machines in various places around campus and the Bloomington/Normal community to offer free basic mending and clothing repair services to anyone in need. These students lend their time, talent, and skills on a completely volunteer basis. Elisabeth Reed, advisor to the Fix It Friday program, reports that, “The fashion industry is the second largest polluting industry in the world, with the average adult throwing away about 70 pounds of textiles a year.” By providing a free monthly clothing repair service to the local community, the fashion students practice their sewing skills while also reducing the amount of textile waste in the landfill. AASHE is a membership-driven non-profit organization working to advance sustainability in higher education. Its annual AASHE Sustainability Awards honor sustainability achievements, research advancements and student leadership. By raising the visibility of high-impact sustainability projects and pioneering research, the awards program helps to disseminate innovations and inspire continued progress toward sustainability. Learn more on the Illinois State Fix It Friday Program Facebook page.